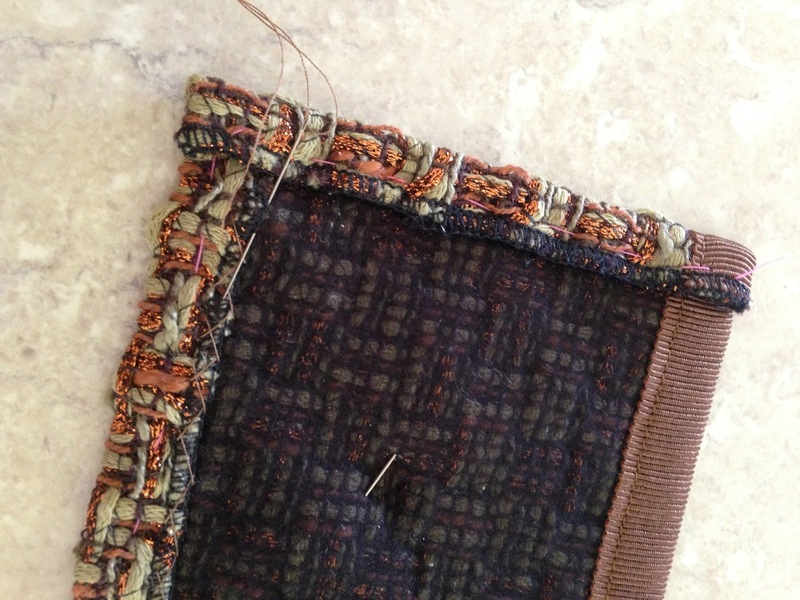 Now it's time to do the pockets. 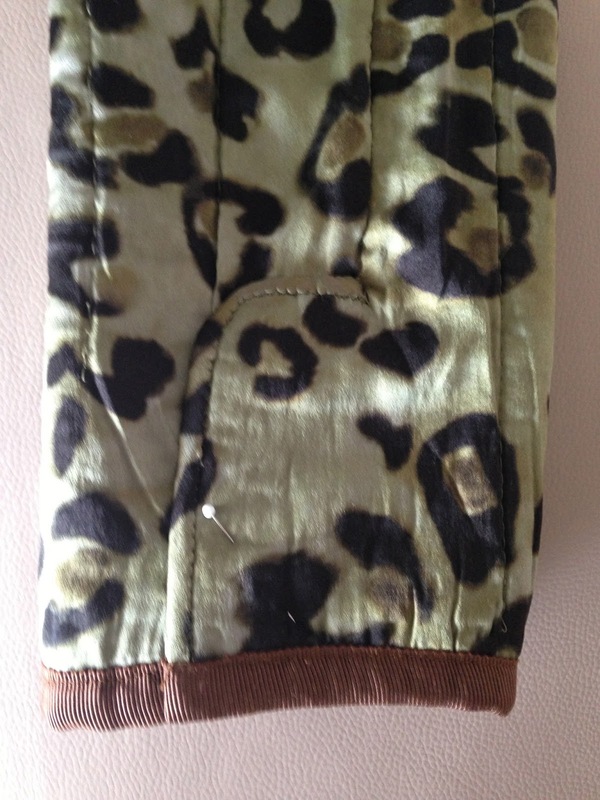 cut, interface and overlock pockets. 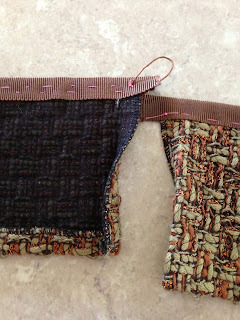 Attach gros-grain to top of pockets and tack in place. Edge stitch gros-grain in place. Press under seam allowance, tack and hand sew carefully. Cut lining to fit pocket. 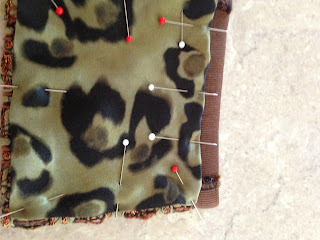 Pin to wrong side and hand sew in place. 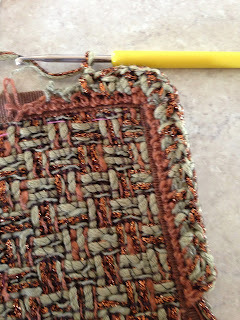 Once pockets are completed, add a row of chain stitch to gros-grain. 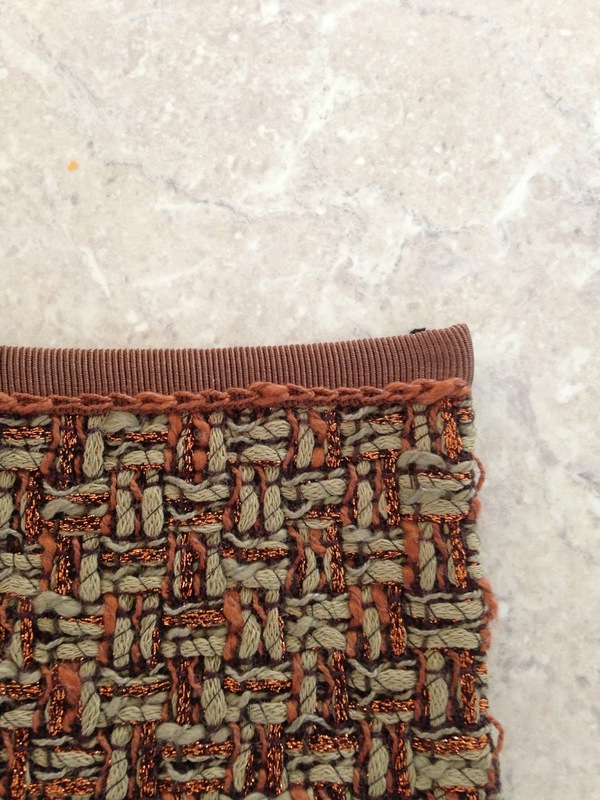 Crochet your braid to chain stitches and neaten yarns at the back. 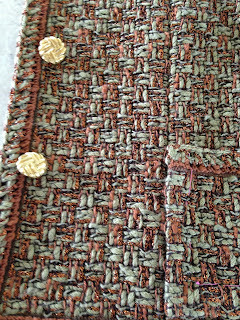 Position pockets to jacket front and hand sew in place. Sew on buttons and give your jacket a final press. Voila, your master piece is now complete. 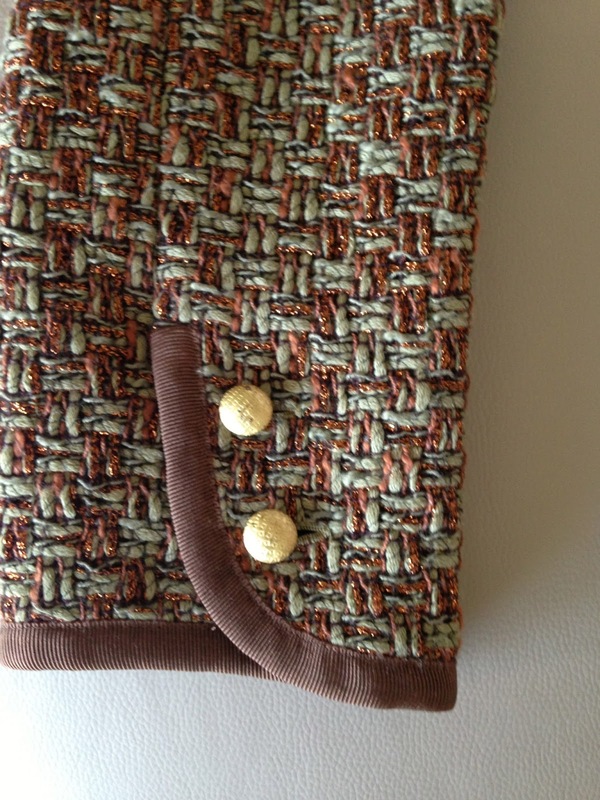 Not sure where to purchase your Tweed? Please let me know and I'll pass your inquiry on to your closest retailer. I'd love to hear from you! 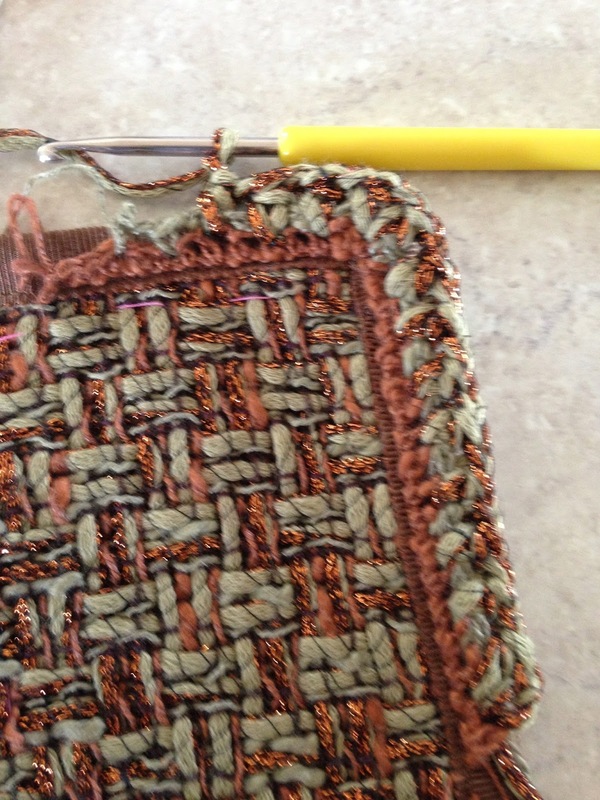 Today, we're working on the hand crochet braid. 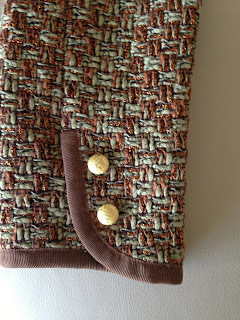 The yarns used in the braid were provided by Linton Tweeds and make the perfect partner. 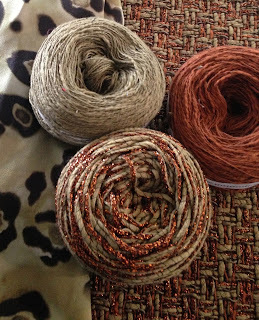 The yarns pictured below were used to weave the fabric. I found it easiest to make up a sample piece first to test various patterns. 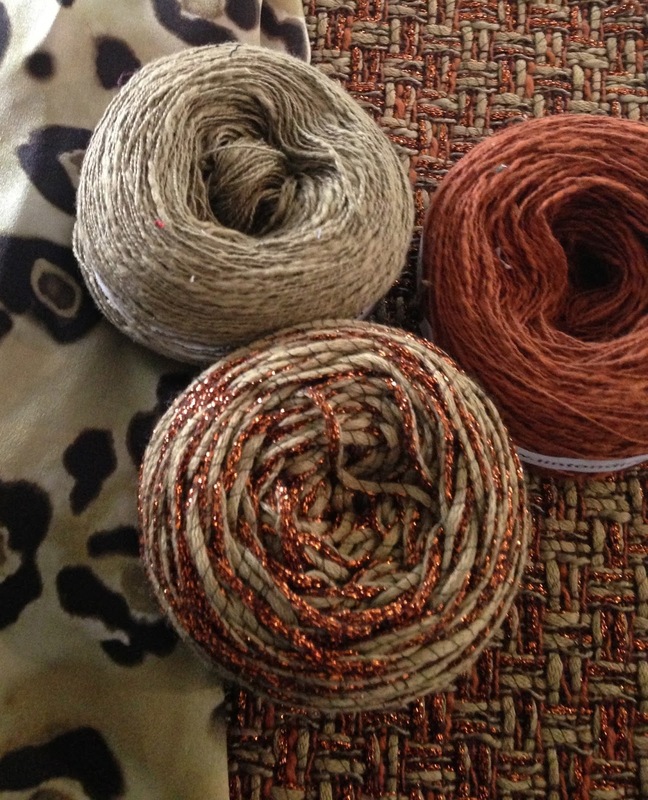 This way you can decide which braid will complement your jacket best. 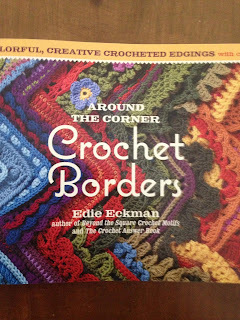 A book called "around the corner Crochet Borders" by Edie Eckman came in very handy. 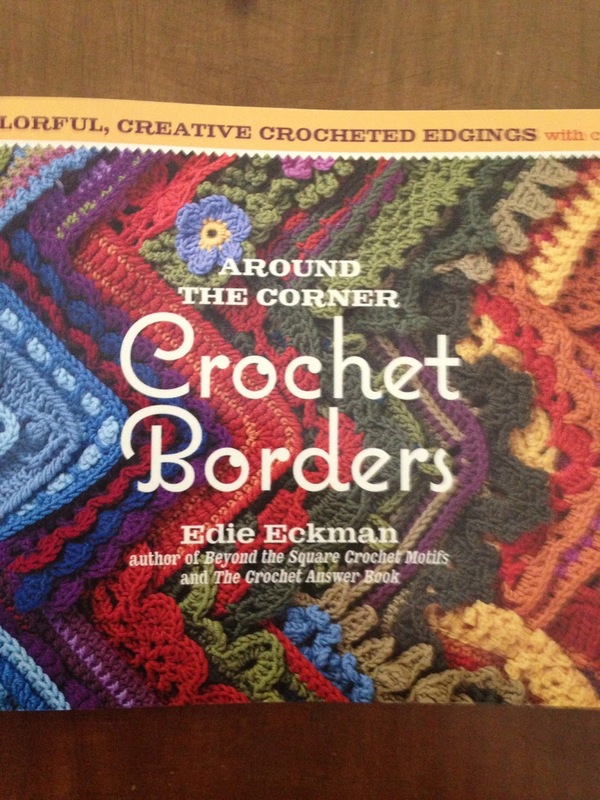 It contains endless border patterns and it shows how to do the corners and many other things you need to know. 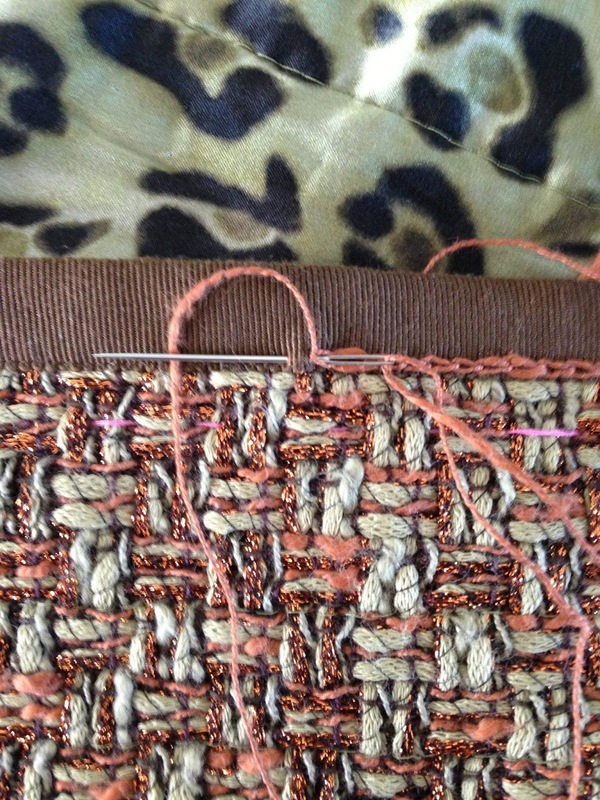 First, work a chain stitch all around the jacket edge. 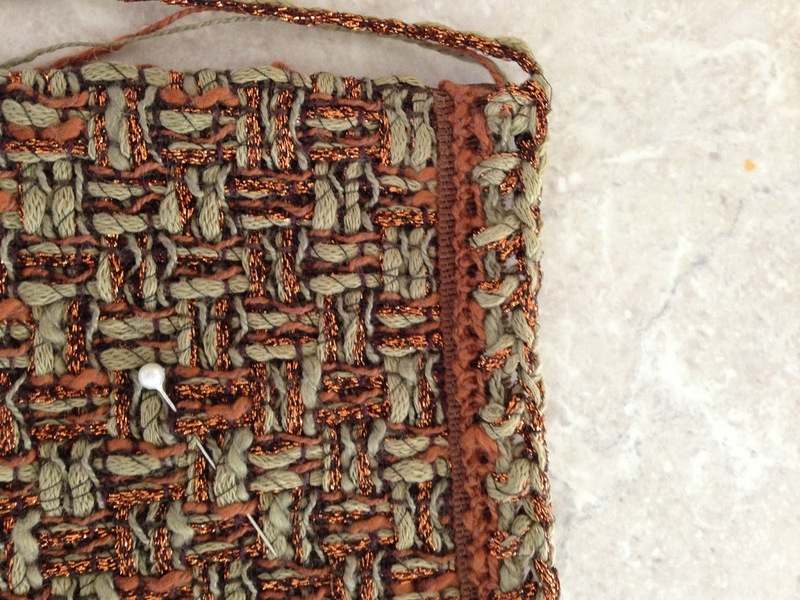 Then start to crochet your pattern to the chain stitches, following the pattern instructions in the book. Read the instructions for the corners carefully and make sure both side on the jacket fronts look identical. 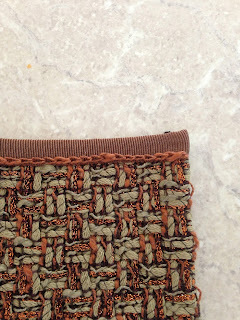 Add a row of chain stitch to the sleeve opening. 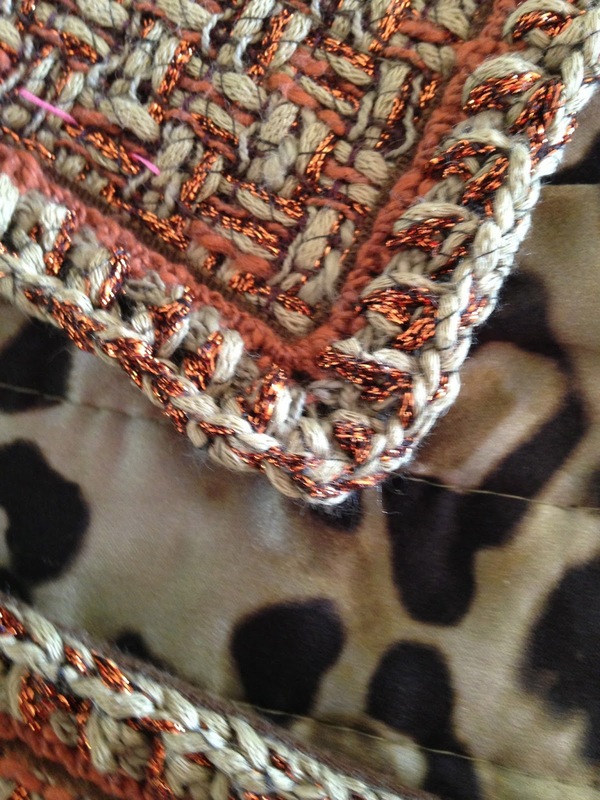 Follow the instructions and complete the opening with your crochet broder making sure the braid lies flat around the corner. 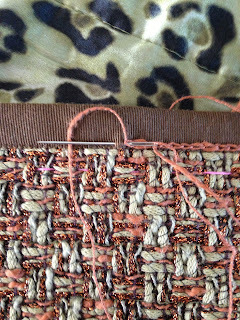 Neaten off the yarns at the back of the braid and press carefully. Not sure how go about this braid? 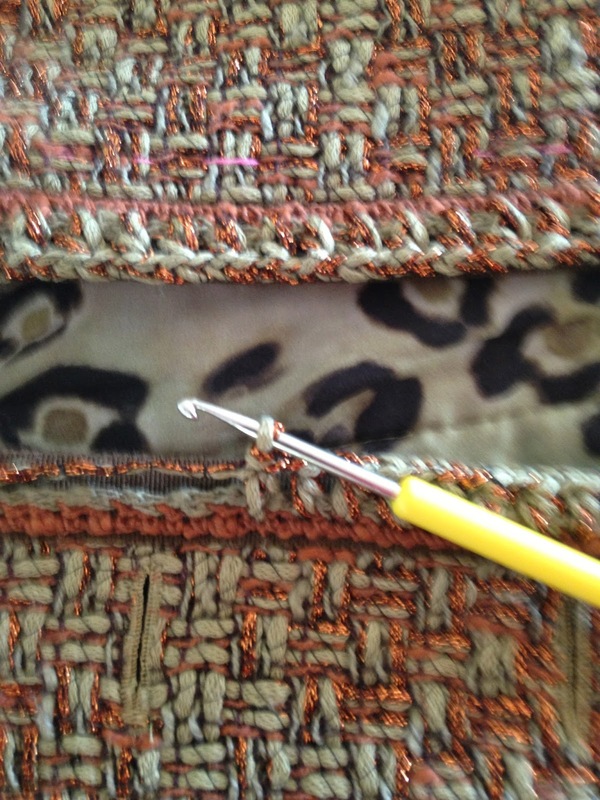 I conduct regular sewing classes and workshops where you are taught all the required techniques to complete your very own master piece. Please contact me by email ricama@bigpond.net.au or phone 07 3300 3470. I'd love to hear from you!! 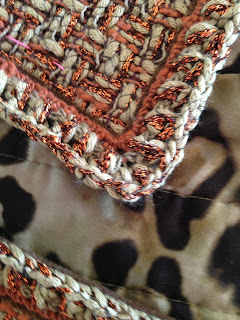 Now it's time to finish the sleeves as it is much easier when they're not attached to the bodice. 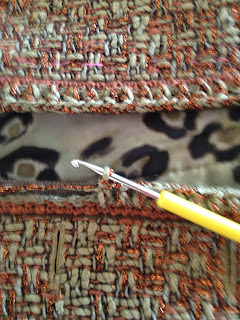 On the inside hand sew the top part of the under flap to the lining to keep it in place. 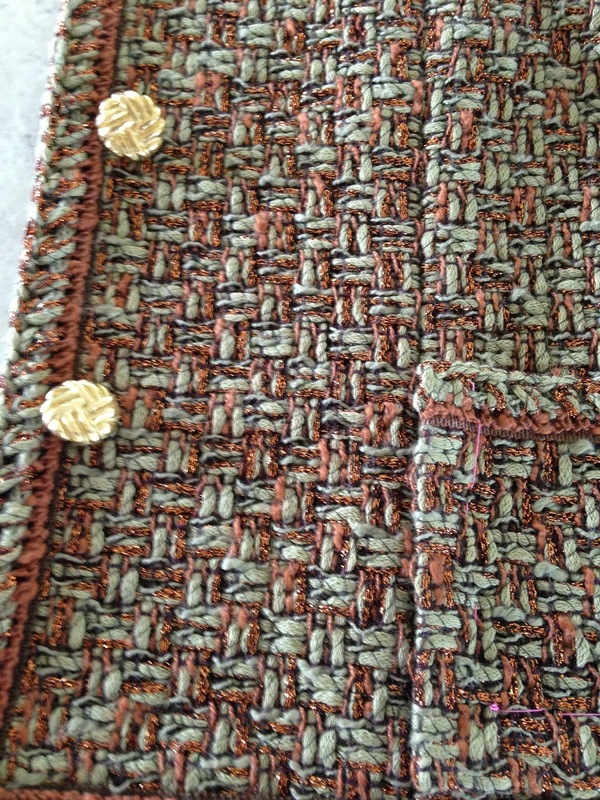 Two buttonholes go in each sleeve. I machine stitch them first and then over the top by hand with the buttonhole silk. 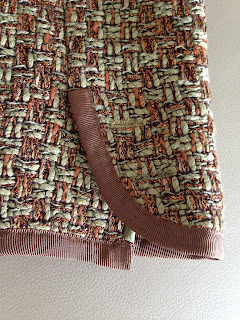 It gives the Tweed extra stability and stops it from fraying. 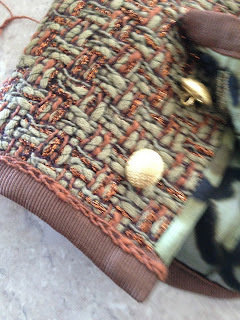 Finally, attach the buttons to the sleeve.